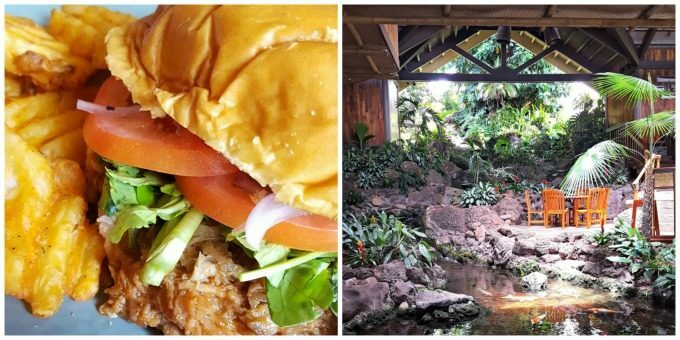 Where to Eat in Kauai – here’s a list of the places we ate while vacationing in Kauai and the food that really made me all warm and fuzzy inside! A huge thank you to The Villas at Po’ipu Kai for providing us with amazing accommodations and to the food establishments below for providing us with meals. One of the things I like best about traveling is eating. Ok, I always like to eat, but it’s fun to eat food that the place I’m in is known for. For example, NYC might be pizza, Memphis barbecue, Paris is pastries in Hawaii, it’s fresh fish and Hula Pie. I know every place in the world is known for something. What follows is some of the food a group of bloggers and I ate while we were vacationing on the island of Kauai for a week last month. 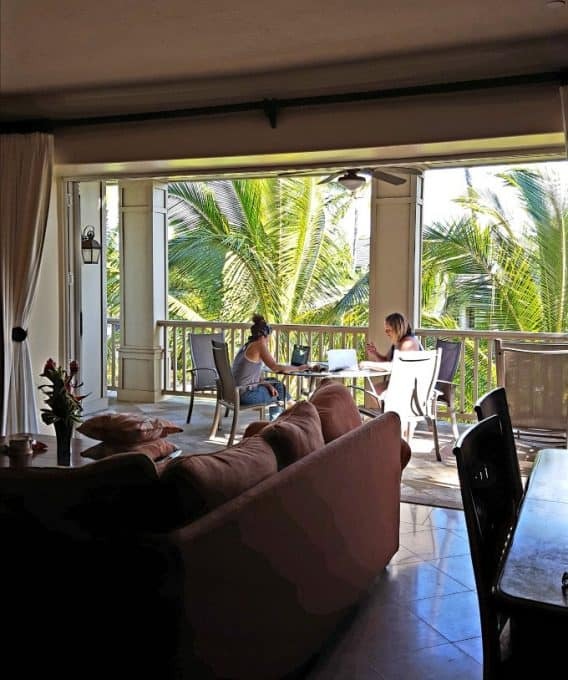 We were fortunate enough to stay at the The Villas at Po’ipu Kai, located on the southern end of the island and about a half an hour from the airport. Both the villas and the grounds were absolutely gorgeous and so well maintained. The villas were completely furnished with multiple bedrooms and bathrooms, air conditioning, and a full washer and dryer! We were a group of 10 women, and stayed in two villas. Each had a gorgeous and fully furnished state-of-the-art kitchen with wonderful appliances. I fell in love with the lanai doors. They opened fully so that you could experience the wonderful Hawaiian breezes. It was so incredibly relaxing! I loved the atmosphere of Hukilau Lanai. The restaurant was opened to the outside, but enclosed and during dinner it started to rain. It was so peaceful and relaxing. 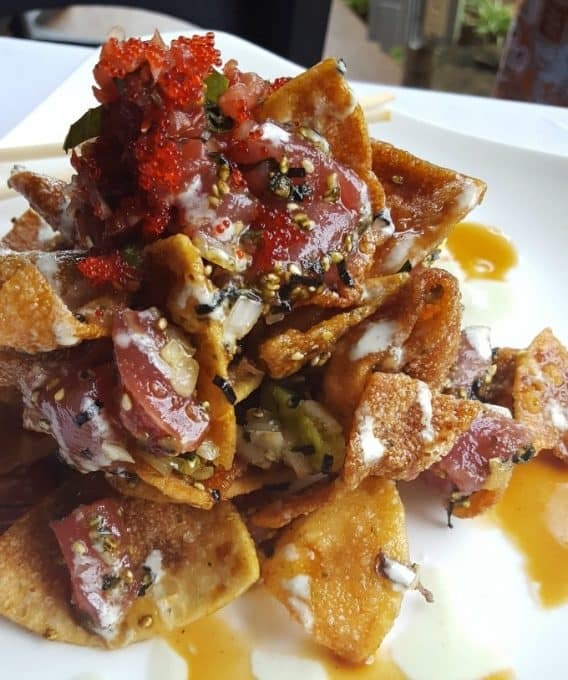 One of the highlights of the meal was Adam’s Poke Nachos (pictured below). I also enjoyed the Sweet Potato Ravioli. Hawaiian sweet potatoes are purple and very flavorful. When you’re in Hawaii, you must also try a drink called the Lava Flow. It’s like a frozen Pina Colada with some strawberry puree. It’s outstanding and you can order them virgin if you’d like to forgo the alcohol. While we were there, we were able to tour two farms. Chef Jaime and two employees of Keiko’s Paradise joined us for the tour. Chef Jaime talked about how the restaurant likes to support the local community and showed us the fresh produce the farm provides for the restaurant. It also makes more sense to have the produce grown on the island instead of having it shipped in from the mainland. The quality is better and each diner will enjoy a much fresher product. 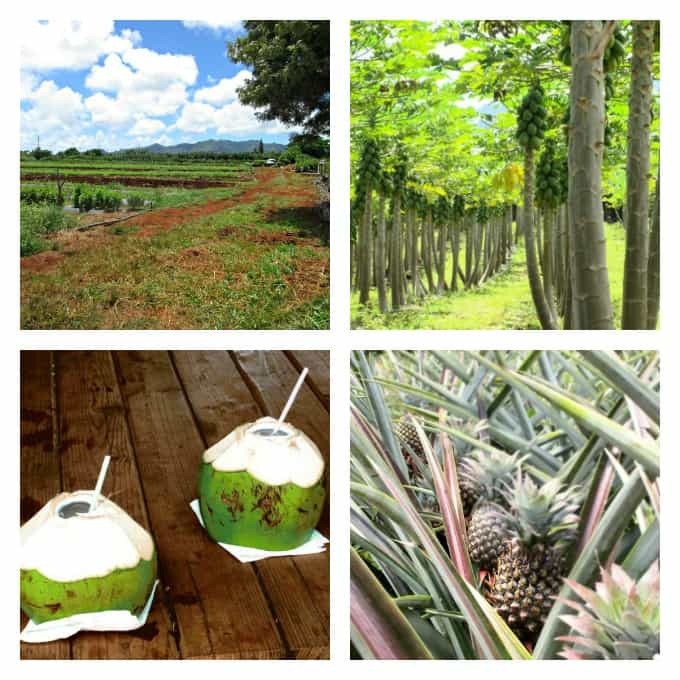 Top left going clockwise: farm on Kauai, HI, mango trees, growing white pineapple, fresh coconut cut open. That night we had a lovely dinner at Keoki’s Paradise which is also a short driving distance from The Villas at Poi’pu Kai. 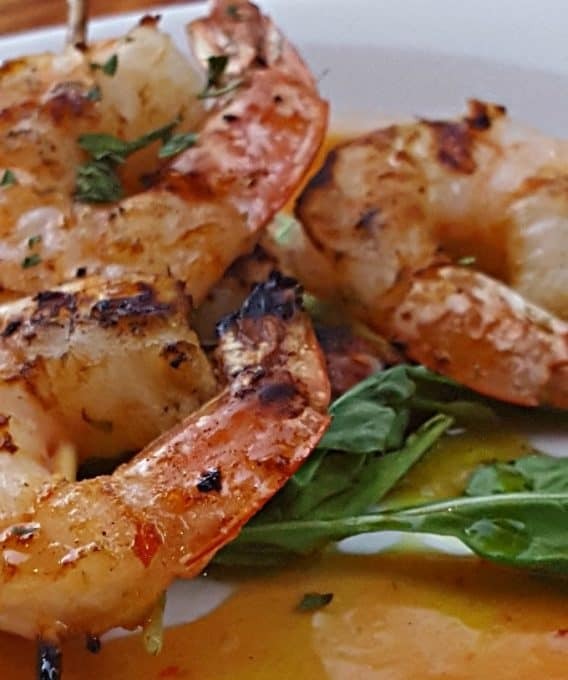 They serve a delicious Mai Tai and great appetizers including the Grilled Thai Shrimp (below). Of course, they are also known for that incredible Hula Pie. Keoki’s Paradise is a sister restaurant of Duke’s, so you know the food is going to be good. What amazed me with many of the restaurants we went to was the view from where I enjoyed my meal and Merriman’s did not disappoint. The restaurant looked out over the ocean making the view of that night’s sunset spectacular. I really enjoyed the Ono Organics Beets With Local Chevre and their Coconut Macadamia Shortbread cookies. I’ve tried on several occasions to remake them, but unfortunately have not been successful. One of my favorite places we ate at was Kalapaki Joe’s. I loved the food, the view, the atmosphere and there was a live band. 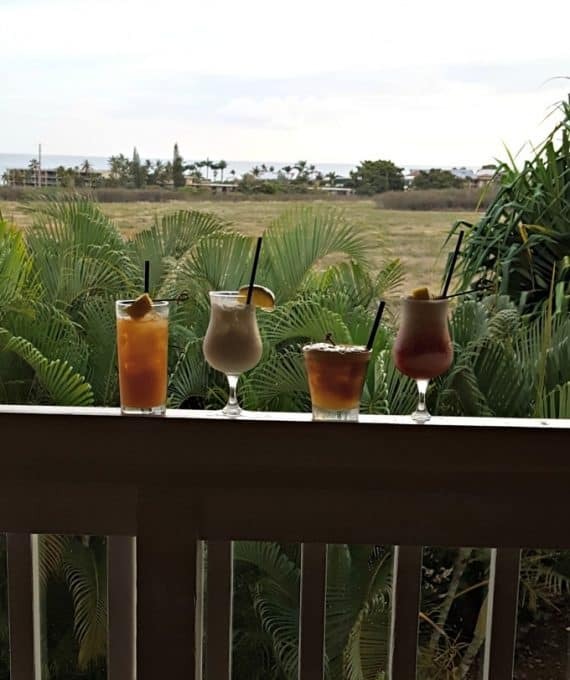 It’s the westernmost sports bar in the U.S., so if you’re afraid you’ll miss your team playing while you’re vacationing in Kauai, head over to Kalapaki Joe’s because they’re sure to have it on. The view was beautiful and it’s only a short walk from The Villas at Po’ipu Kai, so very convenient when you stay there! 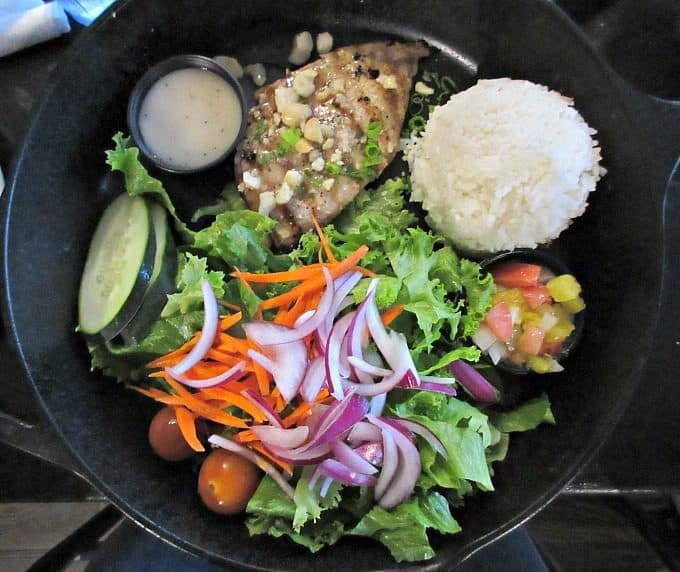 If you’re not a fish eater, don’t worry, Kalapaki Joe’s has plenty on the menu to satisfy your hunger. If you’re going to set foot on the island of Kauai, you must and I do mean MUST (got that, must) make a stop at The Fresh Shave. 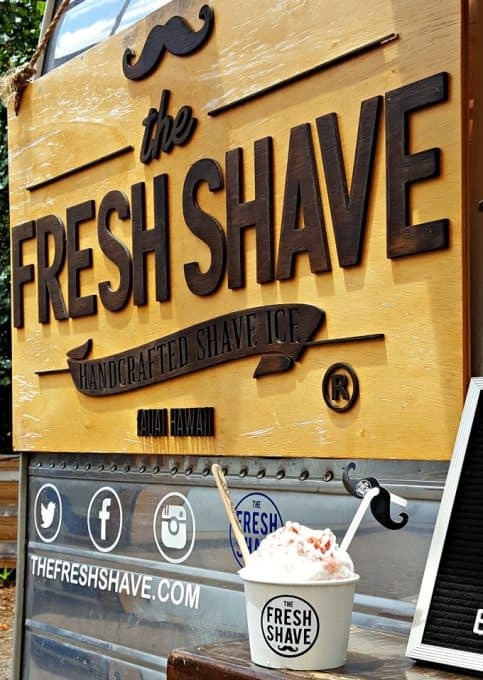 Owners Priscilla and Dan create incredible Shave Ice treats using all-natural, fresh, local, and organic produce. Look for their cute little trailer with their mustache logo. When you follow them on Instagram you can also find out where they’ll be located each day. My favorite was The Fu Manchu topped with strawberry puree, but we tried quite a few and they were all quite delicious. The Chevron is their most popular and that was unreal as well. I loved the lime in it! Also, be sure to ask about their secret items. They offer some great ones daily that aren’t on their regular menu. Duke’s Barefoot Bar not only serves absolutely delicious food, but a gorgeous view of Nawiliwili Bay and the Hoary Head Mountains. It is one place you NEED to put on your MUST-EAT list when in Kauai. Now there are many times when you eat a meal and you know at the end you’re going to want dessert. Then the time comes, but you’re so full and completely content with your meal that you just can’t do it. Well, that’s when you order dessert first! And that’s exactly what we did when we ate at Duke’s and I’m certainly glad we did. Those Hula Pies were out of this world delicious. 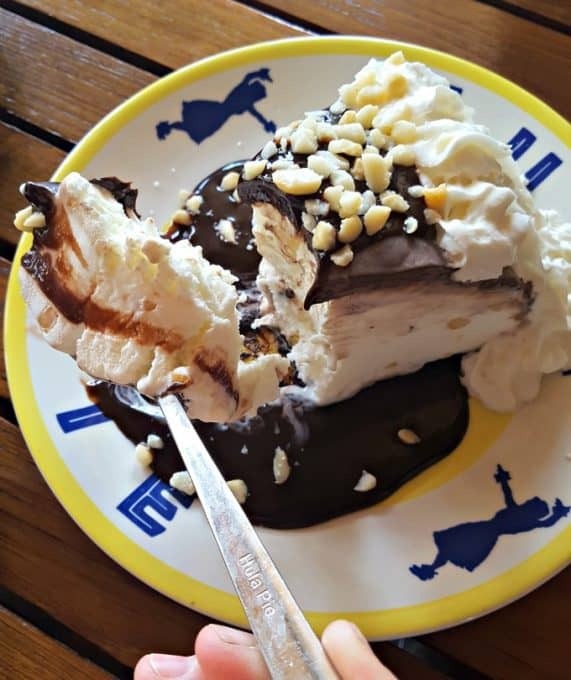 The slices were huge, the ice cream so fresh, the hot fudge – AHmazing and the whipped cream definitely looked like a hula skirt. For lunch I ordered the Pulled Pork Sandwich and it was soooooo good!! Those crinkle cut fries were delicious as well. All of the ladies really enjoyed their meals and the Korean Street Tacos received high ratings, too! So, if you don’t order dessert first at Duke’s, make sure you save enough room to share a piece of Hula Pie with everyone at the table. 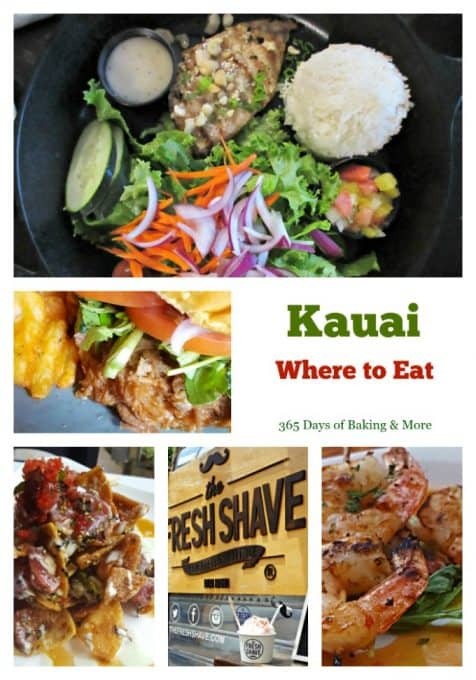 With any of these restaurants you won’t be disappointed and I know when I go to Kauai again I’ll be going back to each of them! A HUGE thank you to all of the businesses listed for sponsoring our trip without which our trip would not have been possible. Also, thank you to my followers for supporting 365 Days of Baking and the establishments I have told you about in this post. I encourage you to visit them on the internet to familiarize yourself with them and while in Kauai. All opinions are 100% my own. Stay away from Anuenue Cafe as much as possible. The only restaurant owner we came across who insults his customers after 1hr and 30mins of wait and after the waitress’ mistake. Got too many customers and so he just wanted to get rid of a few. Nice problem to have, right? Waitress accepted a mistake and still…… How stupid someone can be, go and see the owner of this cafe. — The owner is very rude, staff follows him. — Second, very expensive; we found even our Hyatt breakfast was cheaper. — Any hotel you are staying, they will serve faster. Here you will have to wait surely more than an hour. No wonder the owner is so rude and doesn’t care for any customer. Olympic cafe is closed for some time, they are the only one there so really really rude. We asked the waitress if the togo is faster than sit in; she said it is the same. We said we will sit in then. The waitress gave us the table after 1hr 30 mins of wait and took our order. When we started to eat, the owner came and said that ours is the togo order and we need to leave immediately. He said we jumped way before many. THE WAITRESS SAID TOGO AND SIT IN IS THE SAME TIME THEN HOW OWNER SAID WE JUMPED UP? How we jumped up after waiting for 1hr 30mins? I clearly told him that as per our initial conversation I had clearly told the waitress that if togo and sit in is the same then I would prefer sit in. She agreed and gave us the table. He refused to talk to the waitress and told us to leave immediately and never come again. We pay tips for service and not for insults. We really feel sorry to pay them a huge tip for insults. Go anywhere else for the breakfast except this place. You will never know how busy they will get and how much miscommunication can happen and careless owner will come insult you and will try to ruin your day or trip. STAY AWAY!!! Very very expensive, coffee you can get for $2, for the same you pay $4 here. If you want to have a nice trip, stay away from Anuenue cafe at any cost.